Don’t forget. It’s coming up. We want to see you there!! Posted in Uncategorized | Comments Off on Updated Murray’s Info! Lunches at Mockingbird HQ are generally pretty standard fare, greens and some kind of protein. Small and fine but generally pretty boring. Today, however, NOT boring. We did a tasting for the Bijou Jubilee! at Holly’s Eventful Dining. The fundraising party is May 20 under the big top at Krutch Park Extension and includes buskers and music and food and fun, and it is going to be a truly unique and special event. And me being me after today’s lunch, I would pay the ticket price just for the food. More info and ticket purchasing HERE. We somehow tasted most of this today and it was spectacular. Holly and her team did an incredible job of really making it feel like we traveled the world with her food. 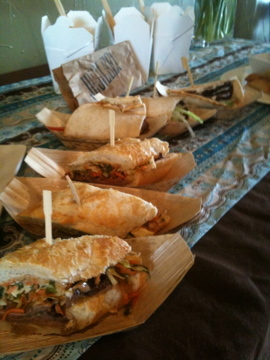 Bahn Mi with super delicious crusty bread and amazing beef. Paletas of lime, acai, strawberry, and more! 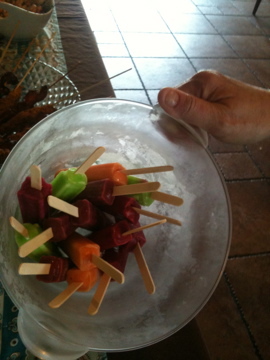 Delicious Mexican Popsicles perfect for a day like today. 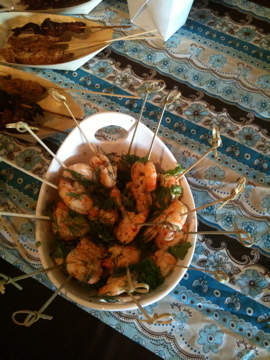 Pickled shrimp with fresh dill and a delicate sweet and vinegar sauce. Ethiopian dumplings. Someday I want to do a dumpling only event. Everything is wrapped and fried or steamed. 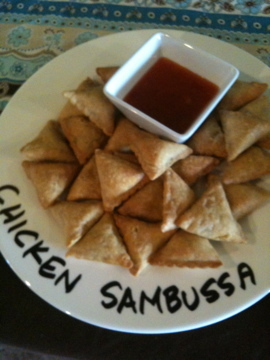 These are served with a sweet chili sauce. We’re going to start a family happy hour at the Public House on April 30. From here on out, you can come by with your little one(s) or with your friends who have little one(s) from 4 – 7. We’ll have a free house made soda for kids and dollar off draft beers & a wine special for parents. The Public House is non-smoking which means little ones are welcome any time but we thought with the nice weather and our backyard space it would be a fun way to spend a Saturday afternoon! Please, please spread the word! The more the merrier. We have lots of exciting news about the Murray’s Cheese tasting May 4 from 6 – 8 at the Public House. First, Murray’s Cheese VP & Cheese Chronicles author Liz Thorpe will be in the house from New York for the evening. Next week we will set up a raffle box at the bar (must be present to win) and will be giving away 20 copies of her book!! We are super lucky that Liz, Amanda and the rest of the Murray’s crew will be at the bar to answer any questions. Highland Gaelic Ale Asheville, NC: A deep amber colored American ale, featuring a rich malty body. Cascade and Willamette hops add a complex hop flavor and aroma. This ale is exceptionally balanced between malty sweetness and delicate hop bitterness. Foothills Torch Pilsner Winston Salem, NC: A well structured Czech style pilsner. The pilsner has a rich full finish balanced with Czech Saaz Hops to ensure that Torch is not your typical pilsner. New Belgium 1554: 1554 Enlightened Black Ale uses a lager yeast strain and dark chocolaty malts to redefine what dark beer can be. A highly quaffable dark beer with a moderate body and mouthfeel. I think that’s it for now. 12 more days till cheese bliss! Posted in Uncategorized | Comments Off on Murray’s Cheese Tasting UPDATE!! 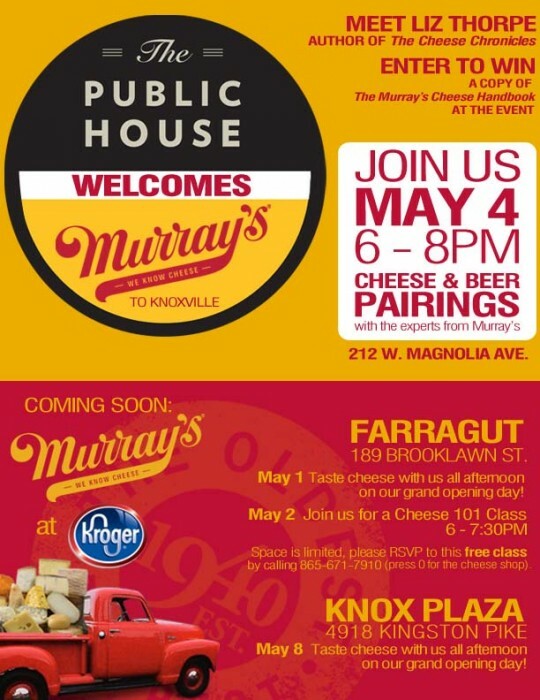 We are excited to welcome Murray’s Cheese to the Knoxville Public House for a cheese tasting on May 4, 2011 from 6 – 8 PM. This will be one of the events throughout the week to launch their cheese counter arrival to two Kroger’s in Knoxville. Murray’s has been a New York staple for many, many years. It’s the oldest cheese shop in the City and generally one of my first stops when I land in New York. The store is jam packed with more cheese than you can imagine. There is Mast Brothers Chocolate, Sandwiches, Coffee, McClures Pickles, Bread, and a refrigerator section with more dairy and sodas. They have cheese classes. Everywhere you look you know you are in a place where people love CHEESE. And what’s not to love with a gazillion varieties (yes that is an exact number) and a flavor spectrum from mild to extreme, I am always very sad for the truly lactose intolerant. My favorite part about Murray’s is the process. You walk in. Grab an old school deli number and wait for said number to pop up. Your cheese monger takes it from there. If you don’t know what you want (And even if you think you know what you want, you don’t. Just let the cheese monger guide you. They have so many unique cheeses!) you can say, hey I want a raw sheep cheese from Spain, and you are promptly presented with a small taste. Don’t like it? Move on. How about a soft cheese from Virginia? You can go on and on. I knew when I started crafting the menu for the Public House I wanted to bring a little bit of New York to it. The best way to do this was through Murray’s. I was able to go through the same process as when I’m at the counter. We ended up with some unique and delicious products. Knoxville is super lucky that Murray’s is coming to town. We will be picking some special beers to pair with the cheeses. Murray’s will have some of their staff at the tasting to talk about the cheeses. Mark your calender and come show Murray’s what a southern welcome looks like! Welcome the Spring with one of these awesome and handy gardening workshops from the Urban Land Scouts. Posted in Uncategorized | Comments Off on Urban Land Scout Workshops! Knoxville Public House NEW WINE LIST! We are super excited. We’ve doubled our offerings and have a few things that are new to the market and a few things that are very unique. Come try something new. We think we’ve picked a group of no fail wines!! Round tannins with cassis and cherry flavors coming the Cabernet and soft spice notes from the CarmÃ©nÃ¨re. A lovely red with rich black cherry fruit, a Burgundian nose and smooth but structured finish. Dark, fresh berry flavors with spice notes and a lasting vanilla finish derived from oak aging. Rich and balanced tannic structure with black pepper and clove spice. This layered Zin is all berries and spice. 100% Tempranillo has a rich red color and expresses jammy fruits with a well balanced acidity emphasizing the freshness of the wine. This 100% Malbec grown in Patagoniaâ€™s cool, dry climate has a dark fruit orientation with a hint of plum. This medium bodied Grenache is youthful and juicy with tangy acidity and intense notes of raspberry, plum and spice. Very unique and exceptionally delicious. A medium bodied Pinot Noir balanced with crisp acidity and an undercurrent of clove and sage. Big and bold, it is dominated by full flavors of dried black cherries and layers of spice with sweet vanilla. Bright, fresh and smooth, super sense dark purple with meaty dark fruit. Intense yet plush. This is an amazingly smooth syrah. A real treat to drink. Exotic flavors of tropical and citric fruits that are in balance with the wineâ€™s natural acidity. Simple, delicate white fruite aromas with a light carbonation adds to the crisp dry flavor of this great summer wine. Flower and citrus aromas balance with the traditional mineral flavors, an elegant and well balanced wine. Crisp and refreshing, this versatile blend of Verdejo and Viura grapes displays delicate floral aromas and forward fruit. Crisp lemon aromas combine with gentle oak notes that lead to a dry, crisp finish. Very light oak flavor that frames the fresh fruit flavors. A beautiful, deep, vibrant rosÃ© color. Bold balanced flavors of fruit and spice with a clean, dry finish. This is an unoaked, organic Chardonnay with citrus and tropical fruit flavors. On the palate, it has beautiful structure and acidity similar to Sauvignon Blanc. Fruity, floral and quite dry, this wine has to be tasted to be believed. A well balanced and savory wine with aÂ fruity and floral and a delecate nuance of refreshing herbs. Spicy and precise on the palate, this is a dry, incisive, pure wine with a long, mineral-driven finish. Posted in Uncategorized | Comments Off on Knoxville Public House NEW WINE LIST!